We love our pareidolia moments. The human brain is continuously at work interpreting the world around us, judging incoming information and stimuli on a range of choices and a spectrum of notions, ranging from food or not-food? to friend or foe? to Do I know you? Look at those clouds. Do you see what I see? Artists have taken advantage of this for centuries. Were I to draw a circle, put two dots toward the top side, a short vertical line under these, and a horizontal half-circle under that, most people would say that I had sketched a smiley human face, even though hardly any human being that any of us knows looks like that. Some neuroscientists say that our brains are hard-wired to look for faces and to quickly identify friend or foe, even with only a part of a face visible. Those ancient humans who survived because of this skill survived to pass that skill on, genetically. Those with superior facial recognition skills today have their ancient ancestors to thank. For most of us, we notice our facial recognition skills when they startlingly vanish, such as when we do not recognize a close friend when we run into them “out of context”: “I’ve never seen L. in the grocery store before, so how was I to know it was her?” At other times, we might see a “face” appear someplace random, on a burnt piece of toast, say. American wall outlets are a smiley face, or at least two eyes above a pursed mouth. Those are two examples of pareidolia, of over-interpreting stimuli. It wasn’t an over-interpretation for our ancestors, but it is when we see a face, especially one we can give a name to like a famous leader or spiritual figure, on a piece of burnt bread. 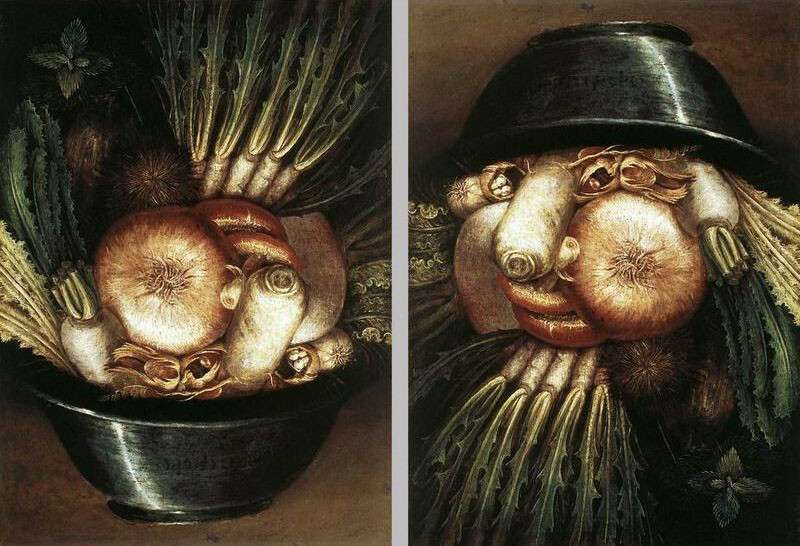 The artist Giuseppe Arcimboldo made pareidolia his theme. The 16th Century Milanese master frequently produced portraits of character types rather than individuals; for instance, a librarian composed entirely of books or a gardener made of vegetables in a bowl. That latter painting depends on the viewer to decide to see the bowl filled with veggies or a human “face.” When is a face a face and when is it a bowl of root vegetables? In the late 1990s, the U.S. Mint started producing quarters that honored each of our fifty states and Puerto Rico. Each year, several quarters were released with reverse-side designs made unique for whichever state. New York’s has the Statue of Liberty, for example. 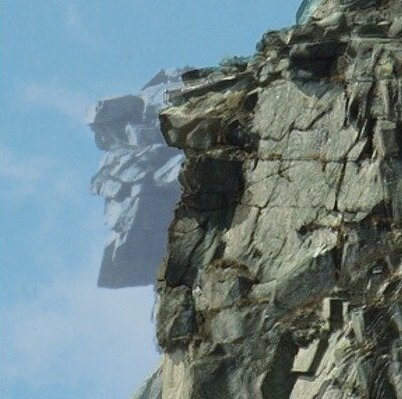 In 2000, one quarter honored New Hampshire and its most visible symbol, the “Old Man of the Mountain,” which was one of the country’s most famous examples of pareidolia. It is not a year I revisit very often. I moved half-way across the country to a new job that year but it did not result in a new life, and I learned the valuable lesson that wherever I moved to, I was always included in the move. My life is mind-bogglingly different now. Back to the New Hampshire quarter in my hand. This is because the one thing most people will know about the forty-nine states that they do not reside in is what those states sell as their image. 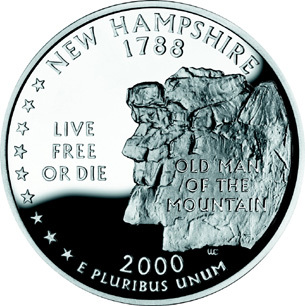 New Hampshire’s state motto is “Live Free or Die,” thus on the quarter it looks like the stone face is declaiming that feisty slogan. Even stone is impermanent, however, and the face-like ledge’s days were numbered. It gave New Hampshire a good two centuries as an image, but by the 1920s, New Hampshire was spending money anchoring the random collection of rocks in place with chains, cement, even steel rods. The Northeast receives a lot of snow and rain, and rocks that are merely leaning on one another will separate with the occasional flow of water in between them and the repeated flux of contraction in cold and expansion in heat. When asked to submit a design for its special quarter, New Hampshire had but one answer, seen above: the Old Man of the Mountain. Three years after the U.S. released that coin, Cannon Mountain released the Old Man; on May 3, 2003, the rocks that made up the “face” broke off and fell from their spot 1200 feet up the mountain. Each and every year 2000 New Hampshire quarter depicts something that no longer exists, but without our human habit of pareidolia, it really never did. A group called the Old Man of the Mountain Legacy Fund was created and started accepting donations to do … something. Build a replica? Each suggestion wound up going nowhere, so by 2013, the group stopped accepting donations. It did build a plaza honoring those who had maintained the “Old Man” through the years and the Old Man itself. It looks beautiful and permanent, and it will open this year, according to the website. A public domain photo showing before 2003 and now. This first appeared in February 2015. My ob/gyn used to apologize if he ran into his patients in a grocery store by saying he didn’t recognize us with our clothes on. Seriously, you can laugh, Mark. And apologies for TMI.